For my 50th birthday last year I was given the chance to hike and sketch in the Flinders Ranges in South Australia. This is somewhere I have wanted to visit since I arrived in Australia, so it was a real treat. There was some fantastic walking and a great camping ground at Wilpena Pound. Sadly, for a European keen to experience red desert conditions, the area had experienced its wettest spring in twenty years and lush green grass covered the floor of the Pound making it look, from the summits of the surrounding mountains, like nothing more than a vast golf course. Good news for the flora and fauna. For the artist, less so. 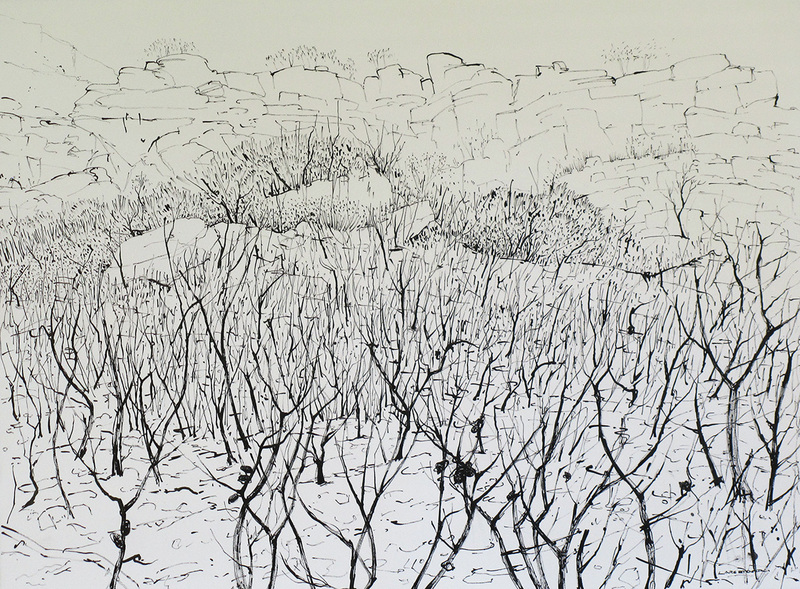 This is a sketch of the track up Mt Ohlssen Bagge, through scorched scrub and rocky outcrops. The guide leaflet says “This hike incorporates excellent reptile habitat” which doesn’t, in fact, mean the place is jumping with snakes, but that the entire ascent is over sun-baked rocks with no shade of any kind. Gruelling.